Snap2HTML takes a "snapshot" of folder structures on your harddrive and saves it as HTML files. What's unique about Snap2HTML is that the HTML file uses modern techniques to make it feel more like a "real" application, similar to Windows Explorer, displaying a treeview with folders that you can click to view the files contained within. There is also a built in file search. Still, everything is contained in a single HTML file that you can easily store or distribute. 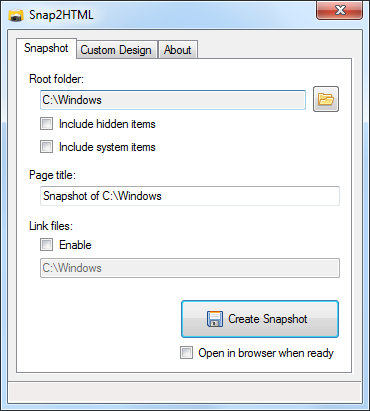 Snap2HTML takes a "snapshot" of folder structures on your harddrive and saves as HTML files. What's unique about Snap2HTML is that the HTML file uses modern techniques to make it feel more like a "real" application, similar to Windows Explorer, displaying a treeview with folders that you can click to view the files contained within (see example output). There is also a built in file search. Still, everything is contained in a single HTML file that you can easily store or distribute. Listings with file explorer "look and feel"
The ability to sort through static lists (click "last modified", "size", and "filename" to sort static files) is already awesome enough, but also includes a near-instant search tool. Hell yeah. I've been looking for something like this. Good suggestion azevedo. Maybe because of it's .Net dependency. Ok, I see. But I'm not sure why .Net should disallow calling a program portable. I use .Net 2.0 for my apps. This is installed on most all PCs today, and it is part of Windows since Vista. Many applications require c++ runtime files too. Are they banned too? You have already listed another of my apps, called Hot Spot Studio, with a note that it depends on VB6 runtime files. How about DirectX "latest version" that you need to install separately? mmx64 wrote: Ok, I see. But I'm not sure why .Net should disallow calling a program portable. I use .Net 2.0 for my apps. This is installed on most all PCs today, and it is part of Windows since Vista. I think that .NET dependency doesn't keep a program from being portable (unless the program depends on a too recent version; 2.0 is definitely OK in my opinion). However, many TPFC members disagree with me. mmx64 wrote: Many applications require c++ runtime files too. Are they banned too? No, because C++ runtime files can be put into the program directory (and are often bundled, as in my game). That can't be done with .NET. mmx64 wrote: You have already listed another of my apps, called Hot Spot Studio, with a note that it depends on VB6 runtime files. You are too defensive here. In some cases, we have decided that a program is simply unique enough to be included regardless of its portability shortcomings. We have an entire category of .NET programs as well. .Net dependencies make an application a little harder, not impossible, to get accepted into the database. I'm a developer defending my own software right now. But I want to point out that I visit this site many times a week. I love portable applications and aim to switch as many as possible of my ordinary apps to portable ones where possible. This site is a great resource. Thus, I want to see as many applications as possible here, so I can learn about them. So I'm not just putting forth these arguments to get my own apps listed, even though I am of course biased. I remember Snap2HTML. Refreshed my memory just now by taking another look at it. Good program. Would vote for it if it were submitted. One feature that may be nice is for the ability to print a full directory structure, including files in their respective folders, on a single webpage. Have to be honest, I think the portable community (both here and elsewhere) is much like any other community. You get purists that want to see programs run without any dependencies. then on the other side you get people who don't care about anything else other than if it will run portably. The pragmatists live somewhere in between the two extremes. I count myself as a pragmatist. If it runs on 90% of systems without fault, it's worth having. Thanks for sharing it mmx64.